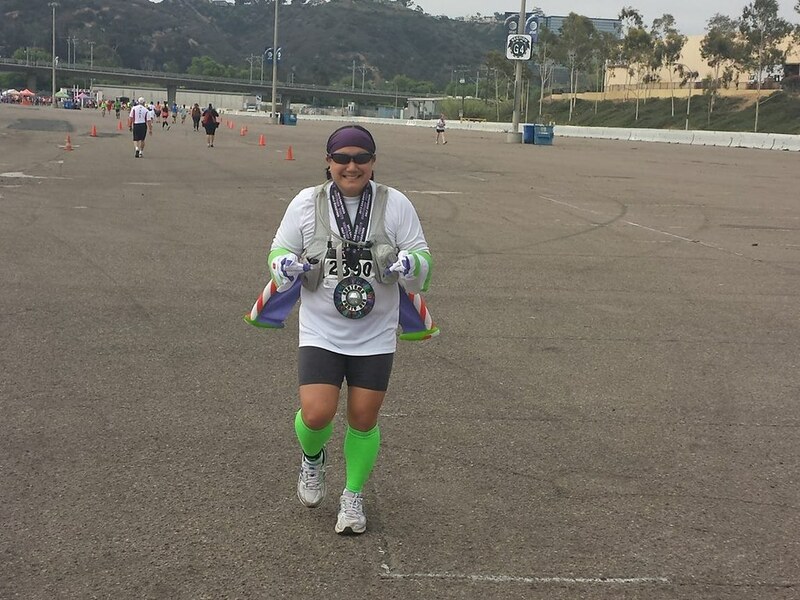 The Green 'Team Superhero' Girl ran the Costume Party Run Half Marathon dressed as Buzz Lightyear last weekend. Last month, I announced I had been selected by the Superhero Events Super Crew to be a Team Superhero ambassador. As a member of Team Superhero, my responsibilities are to represent Superhero Events at endurance events, spread the word about Superhero Events through social media, distribute flyers in my hometown, and volunteer at Superhero events. 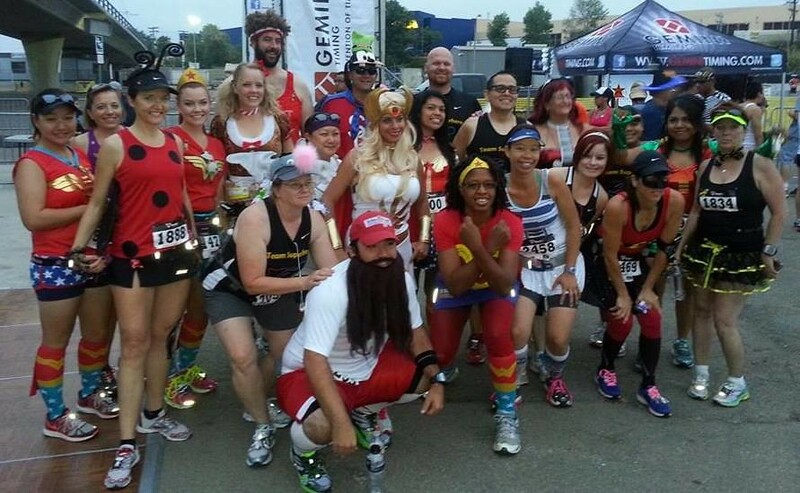 The Costume Party Run included a half marathon and 5k option. 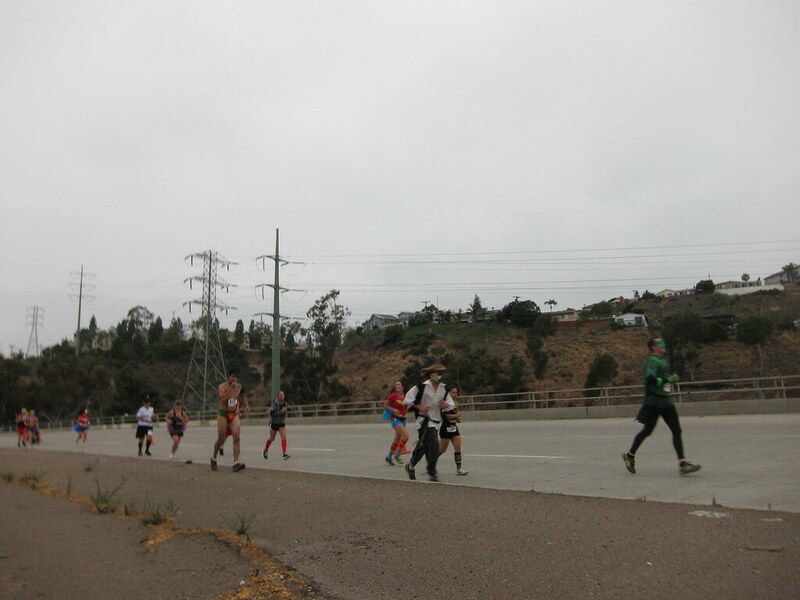 The courses started and ended at Qualcomm Stadium in San Diego. 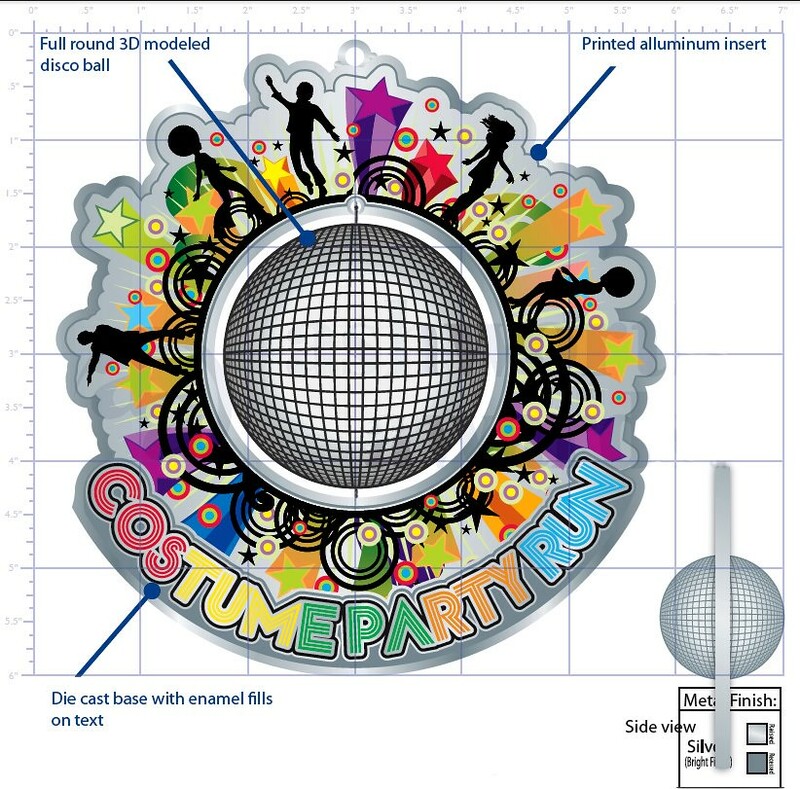 Half marathon finishers received the 'World's Largest Half Marathon Medal' - a giant Costume Party Run 6" 45 record with a mini disco ball in the center. 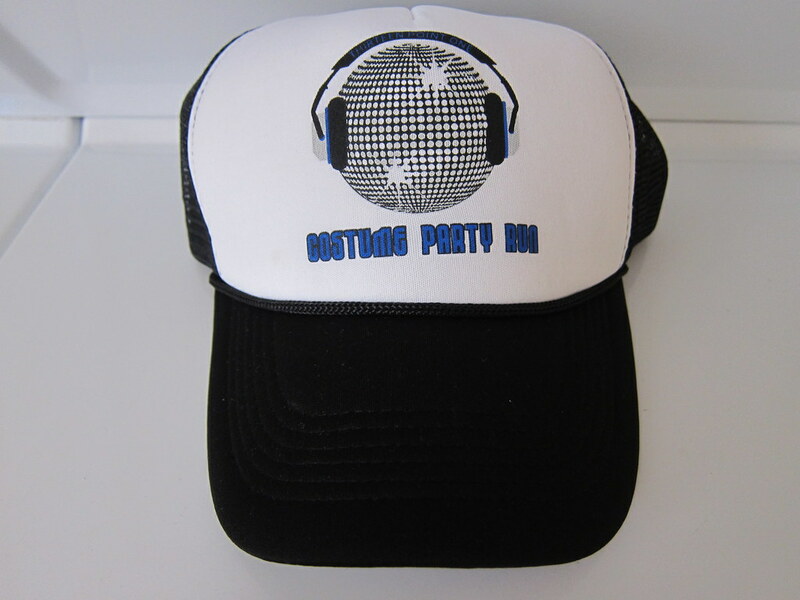 Instead of a race shirt, at the bib pick-up, all participants received a Costume Party Run Half Marathon Trucker Hat featuring a disco ball with headphones. Saturday night, I stayed in the Gaslamp Quarter and took the Trolley light rail system to Qualcomm. It was convenient because the trolley station was in the parking lot of the stadium. This was my first time dressing up for a race so I put a lot of thought into a costume that would be comfortable to run in. Ultimately, I went with an inflatable jetpack that I attached to my Nathan Intensity Race Vest bungee cords, a solid white shirt, a purple Bondi Band, and lime green Zensah Calf Sleeves. Near the starting line, I saw my friend, Busta Groove. She was dressed as Wonder Woman. That turned out to be a popular costume choice among the female participants. I was in the porta-potty line when the race began so I had a late start. The morning was humid and I started sweating immediately. As I headed out onto the course, I met up with a fellow Team Superhero ambassador, Wilmer, dressed as the The Cat in the Hat. I couldn't help but think about how hot he must be dressed like that in the humidity. The course looped out and back from the stadium on Friars Rd. 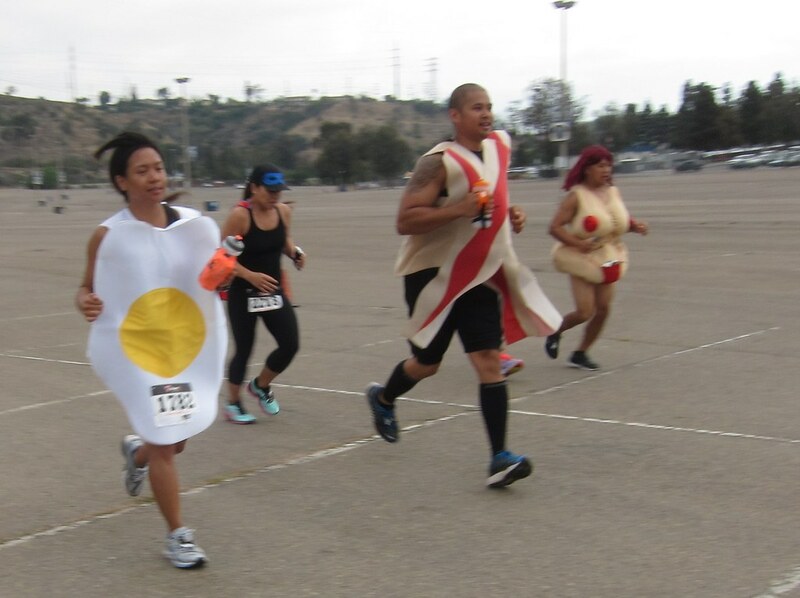 so I got to see all the faster runners in their fun costumes coming back as I was heading out. One faithful spectator cheered us on from the center divider in the road. 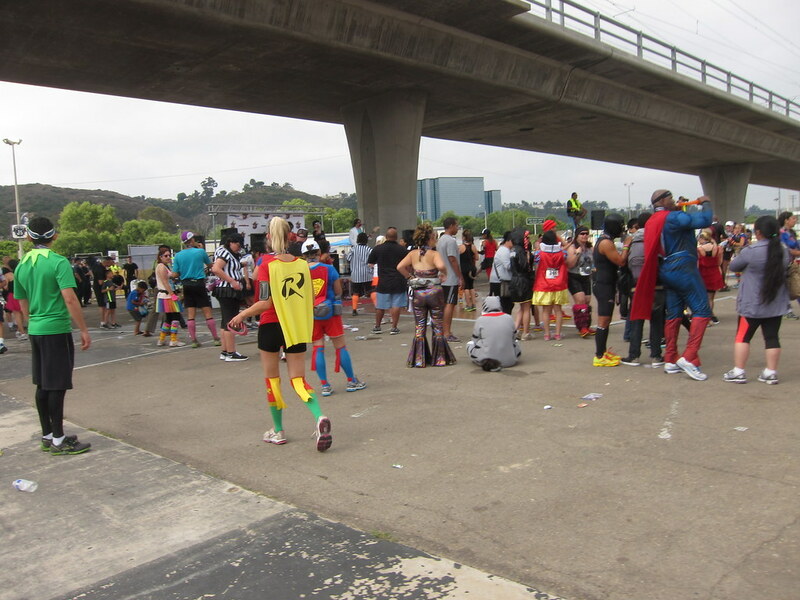 There were a lot of running Batgirls, Batmans, Robins, Supergirls, Supermans, and Wonder Womans. I also saw creative costumes like bacon and eggs, a tube of toothpaste, and a scantily dressed guy in an unidentifiable costume. At one point, I spotted a fellow Buzz Lightyear with a matching inflatable jetpack running in the opposite direction. We raced towards each other and I tried to snap a quick shot of him but it turned out to be too blurry. I caught up to another Team Superhero runner, Misty Diaz, on the course. 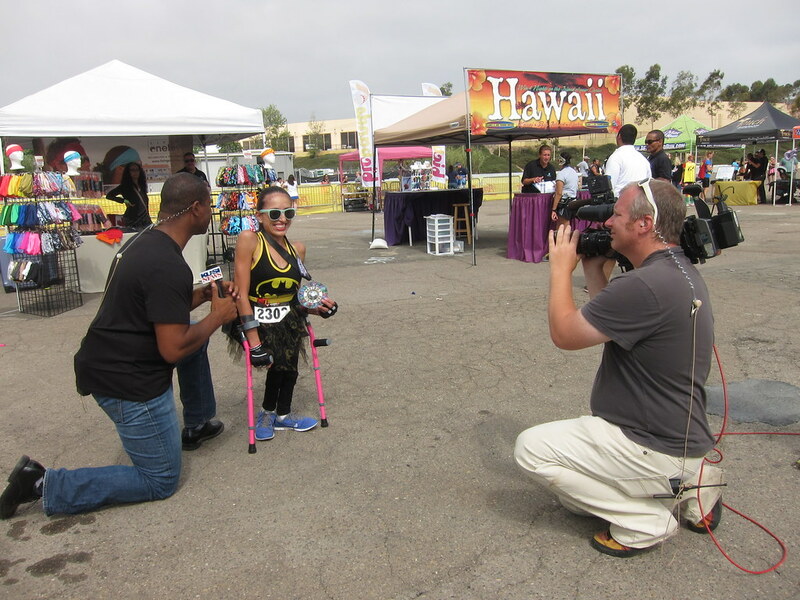 Misty, a runner with spina bifida, was dressed as Batgirl and running with bright pink walking canes. Misty's mantra is Winston Churchill's 'Never, never, never give up'. 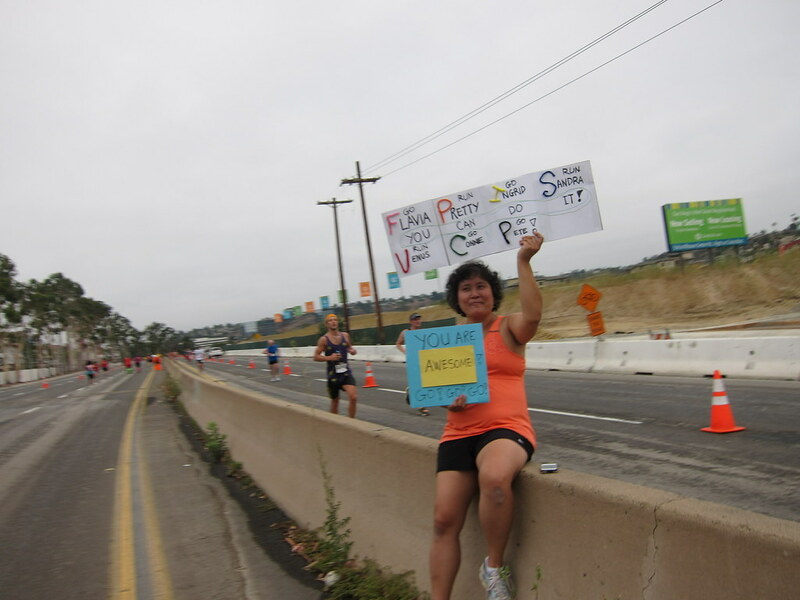 Her energy was contagious as she yelled and cheered on fellow runners. I saw fellow Sole Runner, Scott, on my way to the finish. He was dressed as Batman. I got tired the last couple of miles and stopped to walk a few times. I could see the finish across the parking lot but it seemed to far away. Right before I approached the finish, I slipped on my Buzz Lightyear gloves to complete my galactic outfit. The finish line was a giant costume party. Costumes became more elaborate now that the running portion of the event was over. Race director Ken's alter ego, Michael Blackson MoonRunner, congratulated all the runners on their finish and posed for pictures. It was fun to see so many superheroes walking around with their colorful capes. I was pleased that my foray into the world of costume running as Buzz Lightyear was a success. Sounds like a fun run with all the costumes! Might be more fun just watching or volunteering so you could see them all. Yeah, it was definitely lots of fun to see all the costumes. It's awesome to see how creative the runners can get! Super! Pun intended :) Looks like great fun and what bling you received! And between it all another race completed, well done! Thank you, Johann! Yes, the bling is impressive.